This is the last post in the Fall Fun Series. After this, it’s on to Christmas! 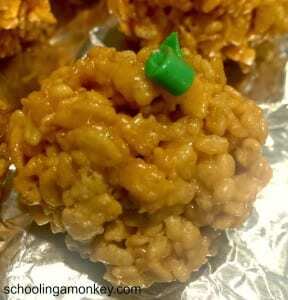 One of the easiest snacks to make are Rice Crispy Treats. I think they are even gluten-free, if you want to avoid gluten. One of these days, I’m going to make a real-food version with my own homemade marshmallows, but until then, at least I can use real butter in the regular sauce. We’ve made quite a few different shapes for these treats along the way, including snowmen, owls, and pumpkins (I’ve also seen ghosts, Santas, and eggs). I like making them into shapes, because it’s fun, kids like it, and it’s easy. 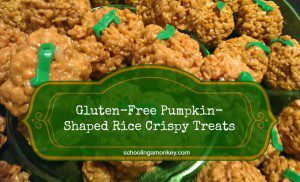 This year, we were responsible for bringing snacks to my daughter’s AWANA fall costume party. So, I wanted to make something themed. We had to make about 80 snacks, so I needed a shape that was easy. And nothing is easier than a pumpkin shape! Here’s one of the little pumpkins up close. You can see we wern’t too careful about how accurate our “ball” shapes were. Mix up your batch of melted marshmallows according to your package directions. I think our version used about one bag of marshmallows and 5 cups of cereal. Add the orange food coloring while the mixture is hot before you add it to the cereal. This makes it easier for the color to spread. Mix the marshmallows and cereal together. Allow the mixture to cool for about 10-15 minutes before handling. I tried to make our pumpkins too early, and all that happened was I burned my fingers and the balls didn’t hold their shape. Wait until you can easily shape the treats without burning your fingers. Grease your hands with butter and form the treats into ball shapes.Like a snowball, you will have to press your hands together tightly to get the balls to hold their shape. I’ve seen some people go overboard by denting the balls to make them bumpy like real pumpkins, but I think that step is excessive. But, if you want to do it, go ahead. Our balls were about 3 inches in diameter. Pipe a leaf shape onto the center of the pumpkins with the green frosting. Allow the pumpkins to harden for a couple of hours before storing. See, super simple. Just like all the crafts we like to do around here. Have you made shaped Rice Crispy Treats? What shapes did you make? Linked up with Quote Me Thursday on Daily Mayo.